In 1878 people lit their homes with candles; in 1879, they had the option of a lightbulb. The point being, that innovation changes the world, and that certain points in history stand to denote a quantifiable shift in our interactions with the world around us. In the realm of modular motorcycle helmets, that year was 2007, and that tentpole from which to build a new expectation was the Shark EvoLine Helmet. With this game-changing motorcycle helmet, riders were for the first time able to rock both a modular full face helmet, and a transformational open-face helmet that still met official safety standards in each state. The innovation of the EVOLine series of helmets resides in their ability to be worn with full-face coverage with the chinbar down, or with the chinbar pulled all the way back to allow the helmet to function as an open-face. Most modulars don’t do this, and are only meant to be worn in the closed position while the motorcycle is in motion. While it was a great helmet in its time, 2016 will see a brand new edition that takes the modular / open faced helmet game to the next level. With the Shark EVO One helmet, riders will get all of the functionality that made its predecessors so popular, while also taking advantage of improved weight, aerodynamics, and overall comfort. Some of the main improvements that can be seen in the EVO-One helmet can be referenced in the way that the air moves around and through the lid itself. All of this starts with the improved aerodynamics that work to accelerate air around the dome, which in turn creates a more fluid movement of air throughout the interior for better ventilation. It also works to keep the helmet more stable at speed, thus allowing riders to make better use of the optimized weight and compact styling. 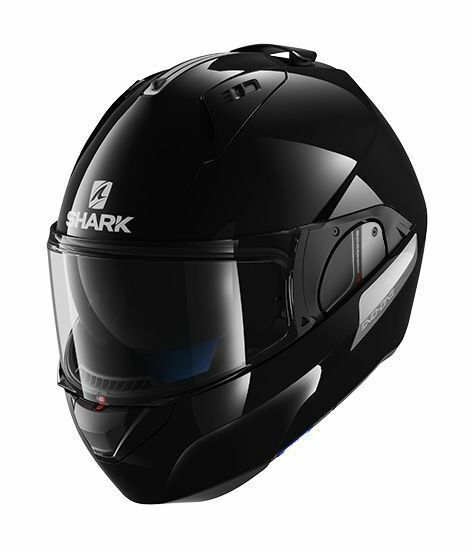 Additional features on the Shark EVO-One helmet include a noise-absorbent breath guard, “perfect fit” interior, and a system of better seals for protection against the rain, the cold, and excessive noise. In 1902, humans had only walked the earth; in 1903, they took flight. In 1926 movies were silent; in 1927 they had came with sound. Creativity. Innovation. Continual improvement and unyielding pursuit of “better”. That is where the Shark EVO-One resides as well, and 2016 is the year that it makes it takes another leap.